Composite resin restoration also called White fillings explained by dentists at Ballarat Dental Care in Ballarat: Composite resins are a type of synthetic resin which is used by the dentist as a restorative material to cover the holes in the tooth or gaps on your teeth in dentistry. The main advantage of composite resin over dental amalgam is the improved aesthesis, which is being white compared to silver. Composite resins come in different shades, which can be used to match the person’s natural shade of the teeth. Fillings for you teeth called Composite resins restoration can be done in a single appointment with our dentists in Ballarat, with or without local anaesthetics, depending on the individual situation. The dentist prepares the tooth or the tooth cavities for the composite resin fillings. Composite resins are placed in layers using a bond and light cured by the dentist for it to be set. The dentist restoration fills the tooth to its natural integrity. Dentist checks the bite and fillings is polished using different techniques. Unlike amalgam, which needs retention for the fillings to stay in, composite resins are bonded to the tooth, therefore natural teeth aren’t destroyed and cavity for composite resin is a lot smaller than an amalgam. 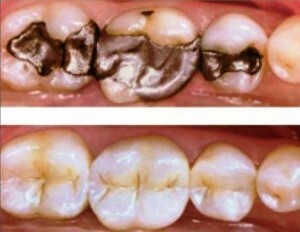 Dental procedure for composite resin restoration called fillings by the dentist may take up 50% longer to place on the tooth than amalgam fillings and it is not a cheap dental treatment compared to amalgam fillings, it works out little bit expensive to do the dental treatment when compared to amalgam fillings. If you need any dental treatment like composite resin restoration also called as the white fillings can be done at Ballarat, please call our Ballarat Dental Care in Ballarat to book your White Fillings appointment and speak to our qualified cosmetic dentist doing composite resin restoration or white fillings in Ballarat.